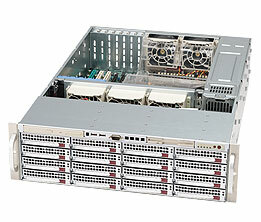 Acme AGD-316EF-6G 3U Dual Opteron 6200/6300 database server. each processor controls 8 of memory DIMM. Include Hardware 6Gb SAS2 RAID controller (LSI 9260-4i with cache memory, plug to PCI-e slot) connects 16 SAS2/SATA hard disk drives. 16 of SATA/SAS hot-swap bays, SAS2 RAID card, SAS2 6Gb backplane with SAS2 expander included. 800W power supply included, option to add a 800W power module for redundant hot-swap function.